Today, I have a quick treat box you can whip up in minutes. 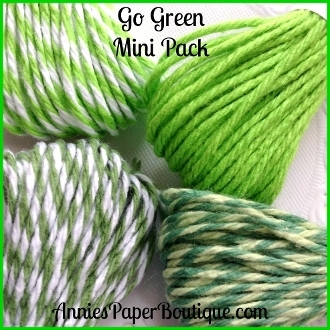 The easiest part is that you can get these great clear boxes right where you buy this fabulous twine--Annie's Paper Boutique! This box is listed as 10 Chocolate Boxes - 2-3/4" x 2-3/4 inch Clear Boxes. Even though it's called a Chocolate Box, I put some fun candy orange slices in it. You do get 10 for $5.75 -- this is a great deal! I really need to get some more now :) When you go over to check out the boxes, be sure to see all the other great packaging boxes and bags you can get. Easter is just around the corner you know! I cut out the flower with my Cricut Explore machine. Then I wrapped my Orangesicle Trendy Twine around all the sides of the box. I just tied it on the top, which is a bit messy, but since I pop-dotted my flower there, you can't see it. When I stickled the flower petals, I did not realize how well it would match the look of the sugared candies inside. I really like that but am not sure how well the picture translates that look. Lastly, I had an Easter stamp set from Close to My Heart just sitting out waiting for me to use and this sentiment just fit the whole package pretty well I think! The next challenge will be up tomorrow so I hope you stop back by to see the details and play along! I cut the box and Lucky out with my Cricut Explore, but I don't remember what cart it came from. It's all online now and I'll need to write it as soon as I click it so I'll remember :) I was very impressed with how well it cut those small swirls though! 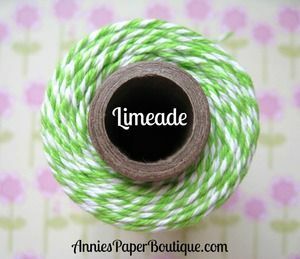 Then I glued my Totally Limeade twine around the bottom of the bag and add those cute bows on both sides. The paper was a bit sparkly, but I decided to add some Stickles to the shamrocks. Totally Limeade, along with Limeade are both still on sale right now. And you have until Friday night to enter the monthly challenge. I really hope you play along--just be sure to check out the rules! If you are on Facebook, be sure to request to join the Twine It Up! with Trendy Twine Facebook Group. There are lots of projects and tons of fun over there! 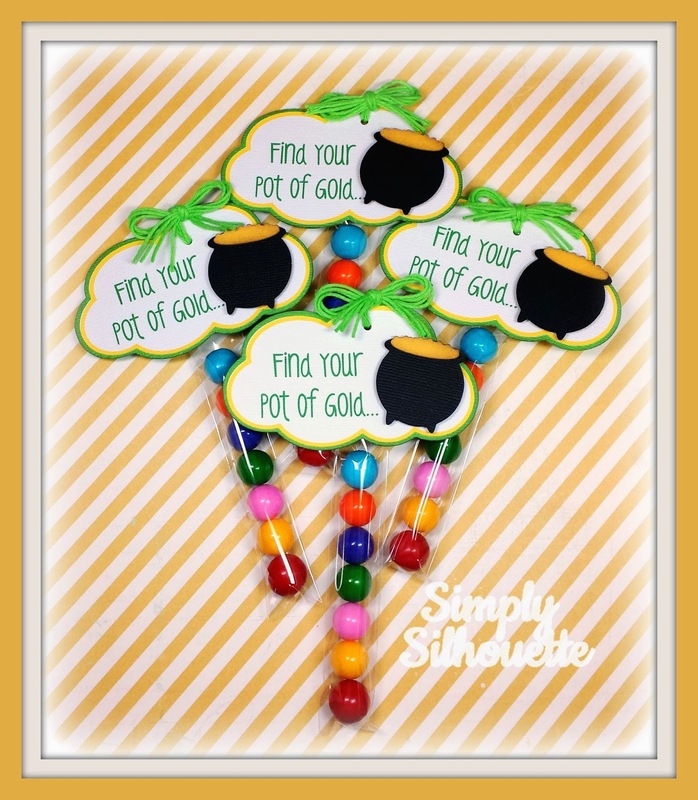 Jessica from Chick-n-Scrap here to share a fun birthday card using one of the featured colors of the month~ Limeade. If you are a follower of my blog, then you know that I love to make Trendy Twine pom poms. I have them on several different projects and they are so super easy to make!! There are TON'S of video's out there showing how to make them and they sure do add great dimension and texture to any project! So for my project today I made a different kind of pom pom....not the really round one but a more fluffy one to add to the top of my party hat. Here is my card! While going through my paper packs, I came across a Basic Grey 6x6 pad that had the perfect matching green as in the twine. I ended up using 2 different pieces of paper from the Bowties stack and some white and kraft cardstock, After cutting out my party hat and assembling my card they way I wanted, I started on the pom pom. Here is another angle of the pom pom. The only difference with this one and the ones you have seen made before is I kept the strings longer and fluffed them by separating the twists to fill out the pom pom more. The more you fluff the more the twist come apart and fill out your pom pom. Gives it such a GREAT look~don't you think??? Lydia here today with a pocket scrapbooking project for you today. 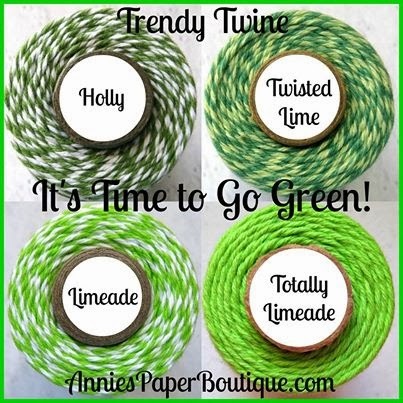 I was so thrilled when Lesley asked me to be a Guest Designer for Trendy Twine! I love twine and this twine is seriously THE best twine around. I've tried others but it is always my go to twine. 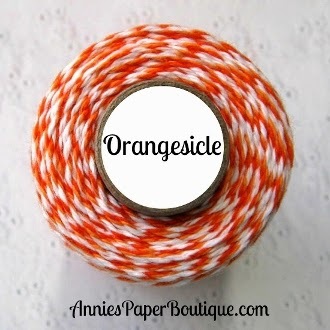 Today I have a pocket scrapbooking page to share with you highlighting the Orangesicle Twine. My boys played basketball for the first time this year and this twine was the perfect compliment for one of their pages. I used this twine to wrap a wooden card I bought at a local craft store. 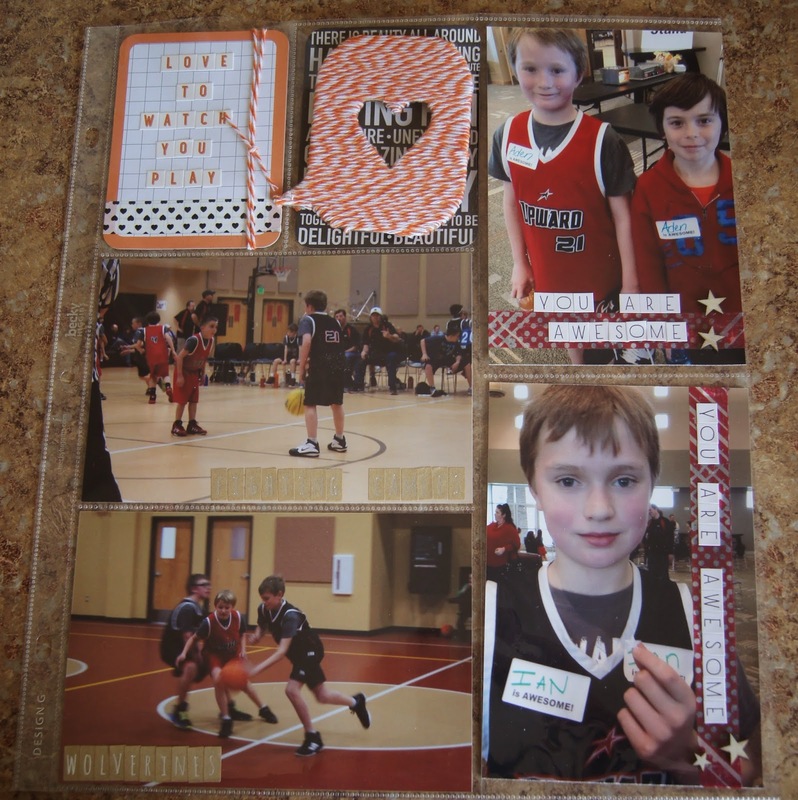 One of the sayings we used each game with our boys was "I love to watch you play". It was recommended by the people who ran the basketball and we loved adopting it. This Orangesicle Twine was just what this card needed to really make it pop. I love the way this page turned out! 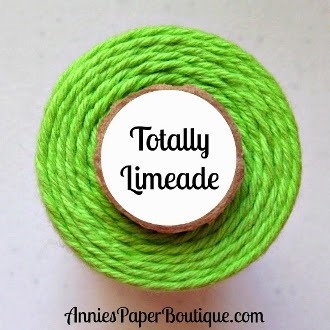 I will be using this twine along with the other yummy colors in Annie's Paper Boutique (the Trendy Twine store) in more of my pocket scrapbooking. Make sure you check out all Lesley has to offer and pick up some twine today!! Happy hump day Twiners! It's Jessi from Kissin' Krafts! Along with the fun Trendy Twine, I added felt to increase the texture of the card. I am not much of a tag maker, but thought it would be fun to add one to a card. I love how the green in the Limeade pops against the soft gray! It's Kimberly, from Hellocutiecrafts here to share a project with Trendy Twine. Those rainbow colors of Trendy Twine can be used on so many projects!! Don't forget to Join in on this month's Trendy Twine Challenge and check out the Specials going on over at the Store, Trendy Twine and much, much more!! Hi everyone it's Brigit from Brigit's Scraps!! 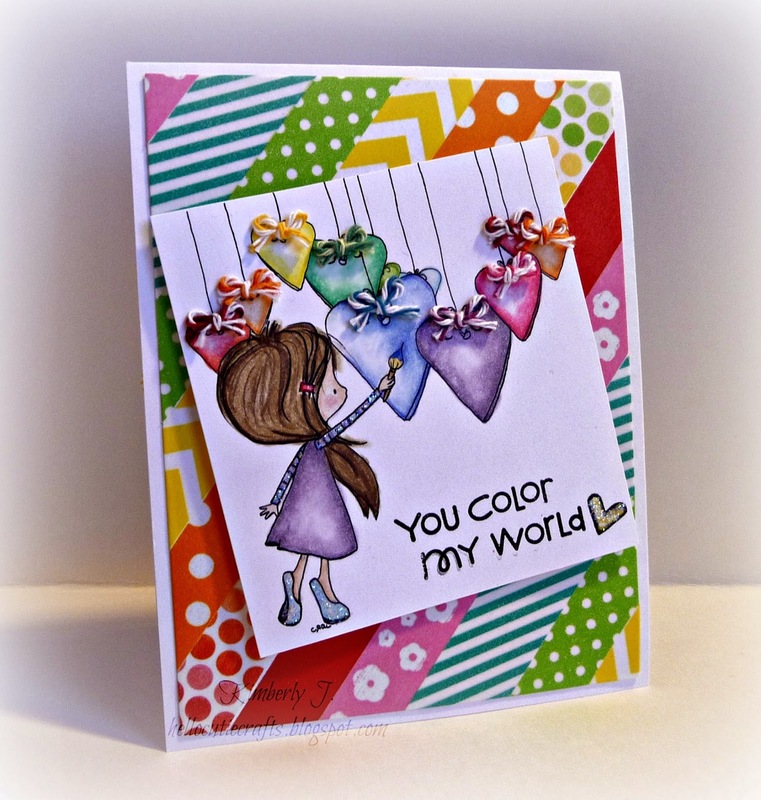 The cute mouse stamp and sentiment is from Peachy Keen Stamps. Jump into Spring! 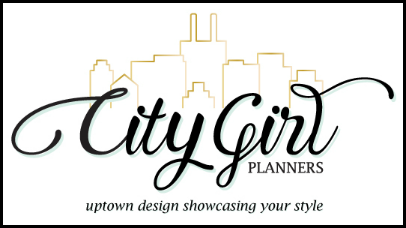 Guest Designer..
Hey everyone! I am so excited to be Guest Designing here today! I just adore Trendy Twine and LOVE LOVE LOVE Lesley.. she is a doll! I have to admit I am totally partial to Trendy Twine. It's the only twine I use. So when she asked me to Guest Design, I jumped on the chance. If you don't know me, my name is Alison from The Alley Way Stamps. 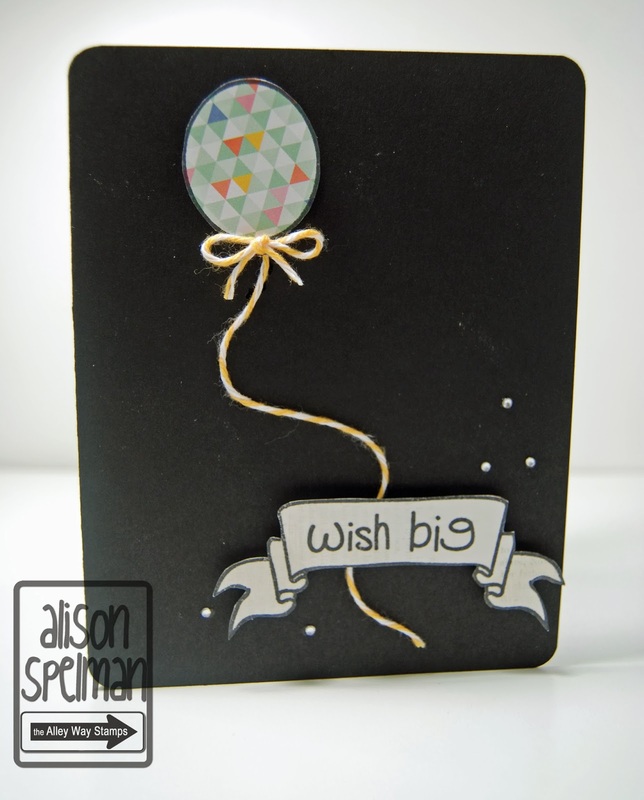 I also have a personal blog Creations by Alison where you can see all the fun things I create! For my project today I wanted to create something that felt like SPRING! Since I am in Utah, and we had SNOW this week..:( this card was much needed. and I love the texture it adds to the card. Of course I felt like this little card needed something else. So I grabbed the Totally White Twine and made a little "carrot line" for my bunny's carrot to hang off of. The Stamps I used are from The Alley Way Stamps. Spring Has Sprung Set. 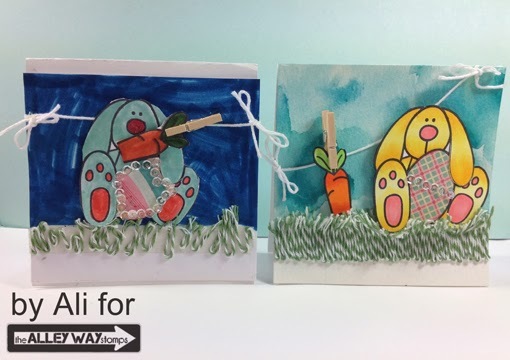 The How To: video of making the card.. It's Migdalia, from Crafting with Creative M, and it's my day to post. one card that I can certainly cross off my list. The design paper comes in a kit called Apple Cheddar from Jillibean Soup. placed a green rhinestone sticker on the center. I made a small bow and stamped "Birthday Wishes" from My Craft Spot. I used TOTALLY LIMEADE and made a bow with it. the cute tag and sentiment. and lots of other goodies too! 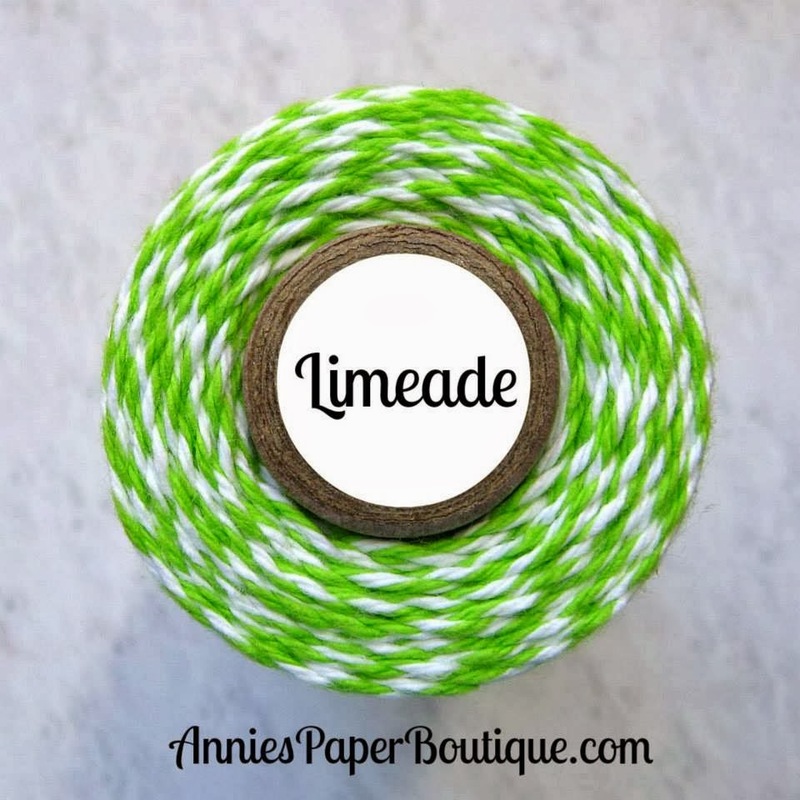 Kimberly here from Hellocutiecrafts sharing a project showcasing Limeade Trendy Twine. and I had to make it for a fellow Hello Kitty lover! 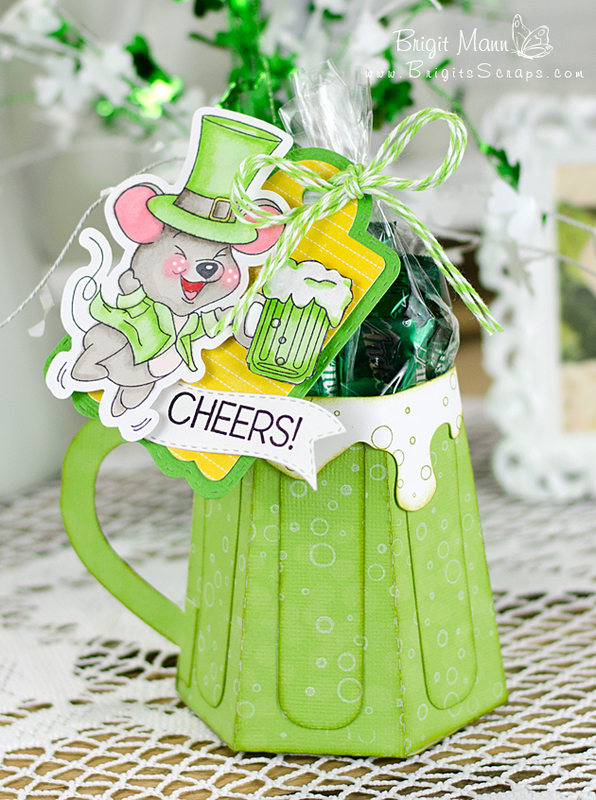 I used some Limeade Trendy Twine for the cute little shamrock banner to add a fun touch to the card. 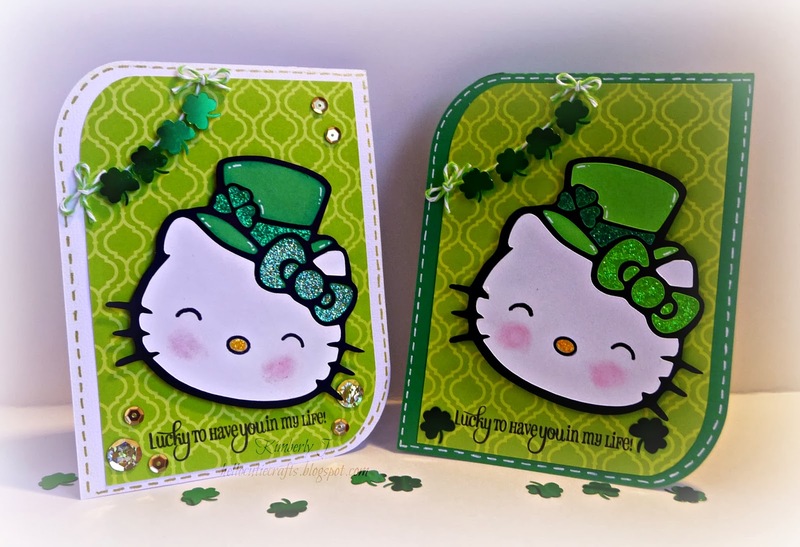 This fun Hello Kitty SVG file is a freebie if you follow Ruthie at September Ninth and the card is a wavy card SVG from SVG Cutting Files. I used Recollections paper and cardstock. I added some stickles and accents with a white gel pen. 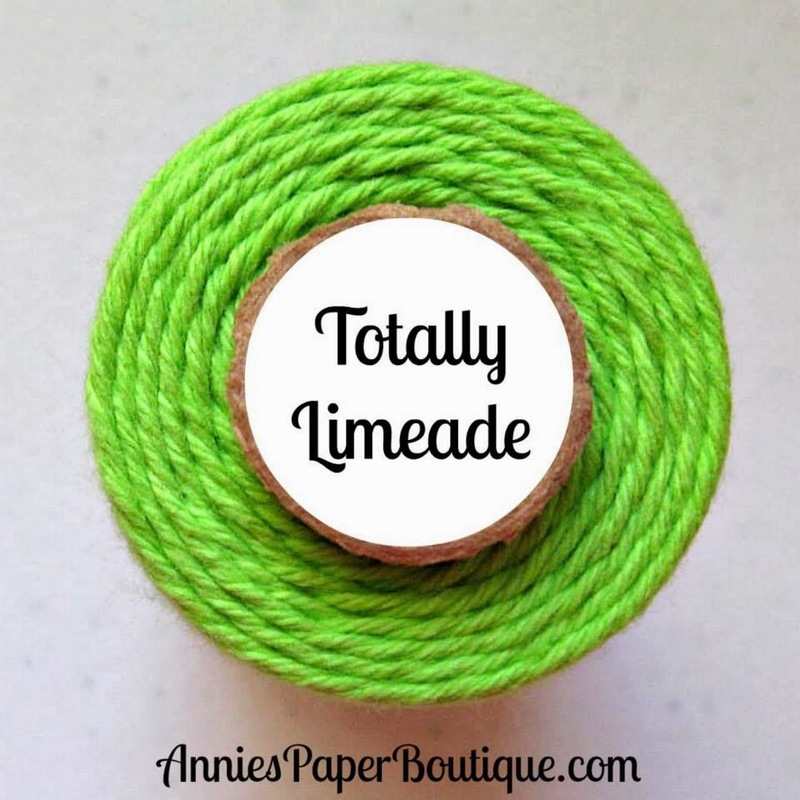 Of course, some Limeade Trendy Twine and then some shamrock confetti and sequins. The sentiment is from My Creative Time "This & That" set and the faces are from Peachy Keen 760 Super Simple Eyes and Noses. Don't forget there is a great sale going on right now! 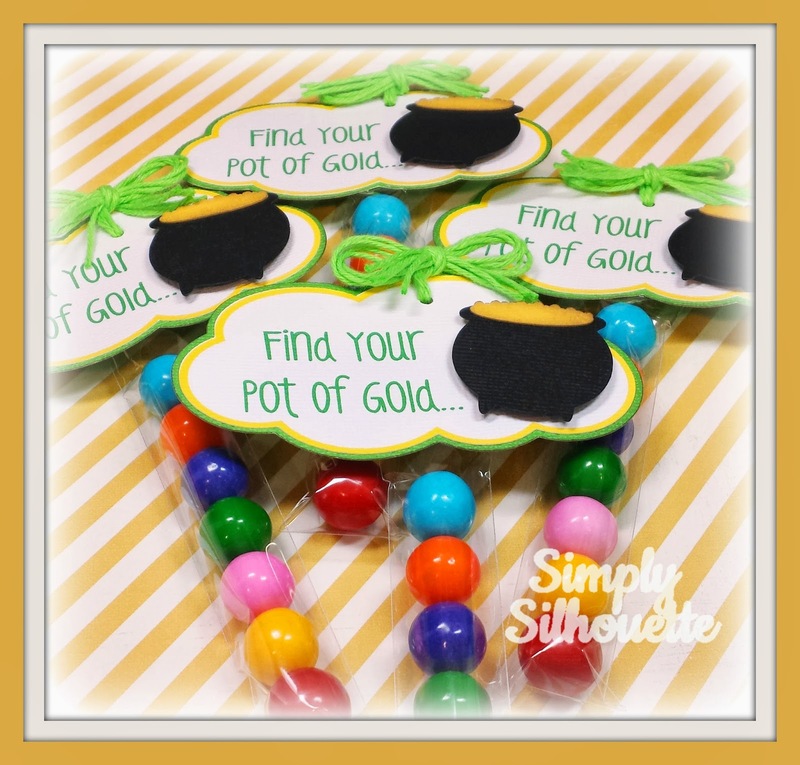 A perfect touch to all your St. Patrick's Day Projects! Don't forget to join this month's Trendy Twine Challenge too! February is one of my favorite months because of all the sweets and treats packaging. Those are so much fun! And we had some fabulous link ups for last month's challenge. is Melissa from M. Miranda Creations. until Sunday, March 23, to use your gift card. This is Sukie and I have a card to share today. This month we are incorporating Limeade and/or Totally Limeade on our projects. For my project, I created a Saint Patrick's Day hat card cut from the Designer's Calendar cartridge and welded together. The shamrocks were cut from Indie Art. I wrapped some coordinating ribbon around the hat and added my glittery shamrock, a chevron button and a double bow in Totally Limeade. For the center of the hat I used the negative piece of the shamrock and wrapped some Limeade twine around a piece of card stock and adhered it to the back. Another small button with twine was added to the hat. Hope you will come join in our monthly challenge. Remember to check out the store for all of your craft needs. Have a great day and thanks for stopping by! Hello everyone! I'm Helen from HTB Creations. I was off for a few months, but am so happy to be back showcasing Trendy Twine! 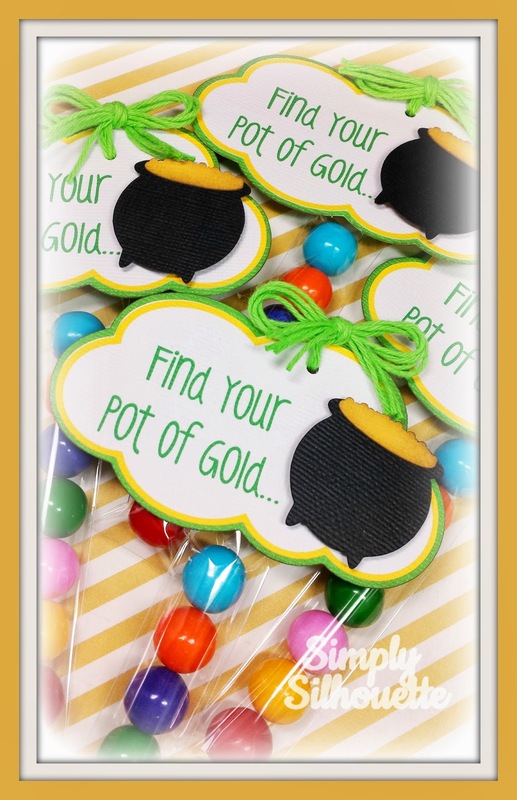 Today I have some quick and easy treat containers that are perfect for St. Patrick's Day. I used both Limeade and Totally Limeade on them. I love the clear boxes--they are so fun to fill with colored candies which then are part of my design. This time, I used M & M's and picked out the colors that fit the rainbow. I added some fun shamrocks and of course, my Trendy Twine. Then I decided to add some gold sequins to the box corner of the plain M&M's. I glued them on with Scotch Quick Dry glue, but they took a bit longer to dry on the smooth box. Now, be sure to join the Good Luck with Trendy Twine Challenge this month. We love to see all the fun projects you enter! Today we are starting off the week with a fabulous post including the whole Design Team. And the best news of all is that Sukie, Helen, and Jessi have rejoined the team. Totally Limeade which is a solid bright green. Both of these gorgeous colors are on sale now. The Design Team created some amazing projects to give you some twine inspiration. Wow!!! Didn't those knock your socks off?! that you appreciate them taking the time to share their projects with you.